This week, I decided to check the record hints at FindMyPast, and found a number of hints for the death of Samuel Stevens. Samuel Stevens married Mary Bell Harley, who was the sister of my great grandfather Alexander Alexander Harley. I had found the death entry for Mary Bell, but the name Samuel Stevens is a fairly common name, which made determining which of the many death entries in Victoria was for this Samuel. From Samuel and Mary Bell’s marriage entry, I had a birthplace for Samuel – Tredegar in Wales. I did a search for Samuel Stevens, without a birth year, but with the birth place of Tredegar, and found a Public Member Tree which had an image of the gravestone for Samuel, Mary Bell, and their son James. I then went back to the FindMyPast record hints, and the second hint for Samuel Stevens was for the same year (1905) in the BillionGraves collection. Since BillionGraves has images of gravestones, I decided to search on for the entry directly on the BillionGraves website, The image of the gravestone on BillionGraves was easier to read than the image on the Public Member Tree. I already had the information that Mary Bell was buried 13 May 1922, and James on 4 February 1886, at the Melbourne General Cemetery, and I was now able to add death dates, and the burial location for Samuel. The Public Member Tree that had the gravestone photo also had a copy of Samuel’s death certificate. This certificate listed his father as Samuel Stevens, carpenter, and mother unknown. Samuel died at the Alfred Hospital in Prahran, from intestinal obstruction and heart failure. He was listed as being 64 years and 10 months old. This indicates he was born about June 1840. He was buried 15 April 1905 at Melbourne Cemetery. His death certificate indicated he had lived about 25 years in Victoria. Since he married Mary Bell in 1870 in Victoria, he had been in Victoria for at least 35 years. The Public Member Tree at ancestry had listed Samuel’s parents as Joseph Stevens and Albinia Gallop. Since the death certificate listed his father as Samuel, and didn’t have any details about his mother, I needed to do more research to try and determine who Samuel’s parents were. I found a family tree at My Heritage which had an image of the gravestone of Joseph and Albinia, which was taken at Corop Cemetery. I knew that Samuel and Mary Bell had lived in Corop between 1873 and 1876, because that was where three of their children were born, but this still wasn’t enough evidence that Joseph and Albinia were his parents. 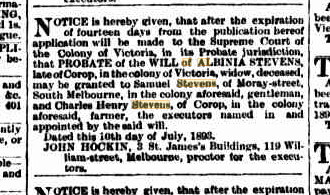 Since the name Albinia is uncommon, I decided to see if I could find a family notice on Trove that would help to confirm whether Albinia was my Samuel’s mother, and I came across a probate notice for Albinia. From the Electoral rolls, I know that Samuel and Mary were living in Bank Street South Melbourne from 1903 to 1906. I also know that their son James died in 1886 in South Melbourne. I decided to check the South Melbourne rate books on Ancestry, to check for entries for Samuel Stevens. The 1893 rate book lists a Samuel Stevens, labourer, was the tenant of Walter Duke at 257 Moray Street. In 1895 Samuel Stevens, labourer, was the tenant of James Crotty at 255 Moray Street. There entries appear to all be for the same person, which indicates that Samuel was the son of Joseph Stevens and Albinia Gallop.